Know someone who deserves recognition as a giant among alumni? Nominate them by June 24. Each year the Webster University Alumni Association recognizes the outstanding professional accomplishments of alumni, their service to the University and their contributions to society through involvement in civic, cultural or charitable activities. This is the highest alumni award given. 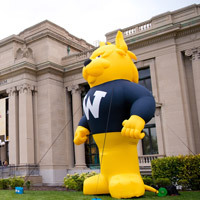 The Webster University Alumni Association annually recognizes an alumna or alumnus who has made specific, meritorious contributions to society through his or her profession and involvement in civic, cultural or charitable activities. This award recognizes high achievement that reflects credit upon the individual and Webster University. The Loretto Award is presented annually to an alumna or alumnus who has given significantly of herself or himself in service to humanity and social justice. The Award is intended to continue the recognition of the community service and social justice values of the Sisters of Loretto who founded Webster College in 1915. This award recognizes an alum who promotes the values and elevates the profile of Webster University through leadership in his/her profession, contributions to society through public service, and ongoing support of the University. This person must be an alumna/us of Webster University who received his/her undergraduate degree within the last 10 years of being nominated and is 35 years of age or younger. The nomination should include a biographical sketch or profile of the person, together with the explanation and supporting materials why the nominee qualifies for this recognition.